Opossums are not aggressive, however, the can scavenge for food and water around homes and some isolated places, however, they can create numerous unsanitary and unsightly conditions, and may turn aggressive when they become infected with diseases. There are several ways of getting rid of opossums from garbage cans but the best option is to make your environment less appealing to the animals. Making your environment less appealing to opossums means you must empty the garbage cans as soon as possible, secondly, opossums can open half-closed garbage cans, however, when you make the cover tightly locked , then it becomes difficult to open. Make sure the garbage can is placed on a flat surface so that the animal does not knock it off. Secondly, you can also get rid of opossums by setting traps inside the cans. The traps used for this purpose should not kill the animal but hook their bodies so that they don’t run and after this you can remove the animal physically. Spring traps or hinged door traps are known to work best for capturing Opossums. Though the use of scaring tactics may work temporarily on getting rid of Opossums from garbage bins, however the animals will eventually return when the scaring tactics such as vibrating sounds, don’t work. The spraying of potent chemicals such as Ammonia and mothballs inside garbage cans may also work in repelling the animals for a while but they may soon return after the strength of such repellents , become dissipated. If you are applying a chemical like ammonia, make sure you soak a piece of rag in the substance and then throw it inside the garbage can- the rag serves as a wick that release ammonia fumes to the top. 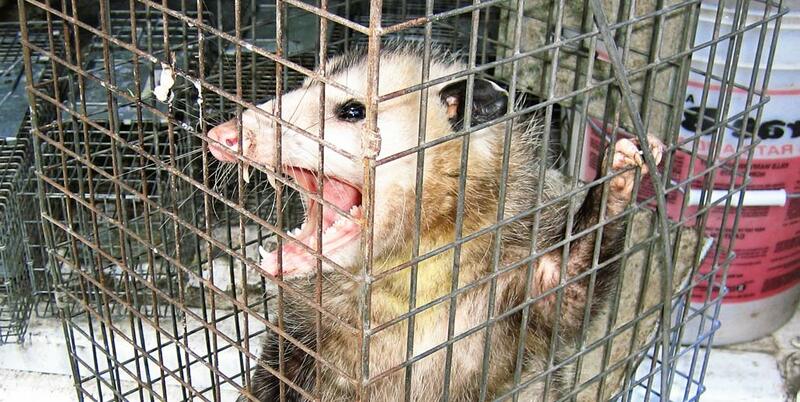 Opossums hate the smell of substances such as moth balls and ammonia. Make sure your garbage cans do not spend long hours outside overnight, as opossums are active both in the day and night. If the garbage cans have to stay outside overnight, make sure they do not overflow and raise suspicion to the animal there is food around. The use of opossum predators such as dogs, may also work on getting rid of the animals during the day, however, opossums will lurk around and return to the garbage bins when they don’t spot their natural predators. The best way to get rid of opossums is to ensure that they don’t get into garbage bins in the first place, because it can be difficult to get the animals out from the bins. Go back to the main Opossum Removal page for more information about How to keep opossums out of my garbage cans.